Lunch Boxes of Love is a community outreach program built to ensure growth and Community interaction. Around 200 people are able to get a hot meal each time we come together and do this! Join us as we tear down the walls and come together in unity. This is the time we get all that ready! Join us! St. John’s is a member congregation of Metropolitan Community Churches. Look for us in our home at 622 Maywood Avenue between S. Saunders and Lake Wheeler just off I-40. After many years in our building on Glenwood, we now have more parking and all meeting spaces are located on the same level. Come see what God has provided. 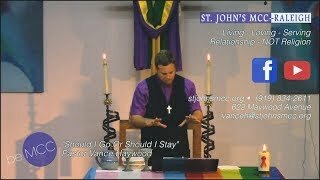 "Should I Go Or Should I Stay"
copyright © 2006-2019 • St. John's Metropolitan Community Church • All Rights Reserved.